A vital first step before creating a website is working on content strategy, and a very important part of your content strategy is going to be figuring out your site map: what pages will be on your website, and how are you going to organize your navigation so that people can find what they need? If you already have a website, it’s always good to take a look at it after some time has passed, reassess your goals, and adjust your pages and navigation. It can be great to do this on an existing site, because you will hopefully now have some data and feedback to use to inform your decisions. At Aeolidia, my web design company, we have built content strategy consultations into all but our simplest projects, because we’ve realized that without a good content strategy, you are not going to have an effective website. I polled our designers and developers for their thoughts on site pages and navigation, and together we came up with some great questions to ask yourself to get started, and some general tips. Download my worksheet and let’s work on building your site map! Learn how to whittle down your content and strategically plan your website links. Awesome! 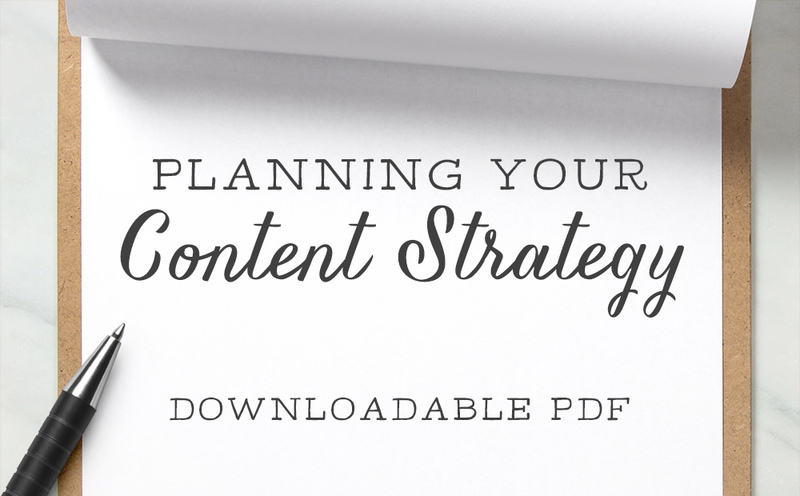 Your free content strategy planning guide is on its way. You’ll find it’s hard to plan without a goal in mind! List out the goals of your website. For example, if you have an ecommerce website your primary goal is likely to be selling your products. You may also have a secondary goal of showcasing your custom work and creating interest in that, or a goal of attracting more wholesale customers. Go ahead and brainstorm here. What is every possible thing your website could do to benefit you? Once you have these ideas, rank them in order of importance, so you’ll know how to prioritize the different sections of your site later. Your visitor’s goals are almost as important as your own, because your website won’t do you any good if visitors aren’t interested in it or can’t find what they want. If you have a site that you’re redesigning or adjusting, dig into your stats and analytics to see which pages people are going to. You should be able to find out what is valuable content to your visitors here, and what they aren’t interested in and don’t explore. Now you can brainstorm all possible pages you may include on your website. It’s fine to include anything at this stage, and you want to be sure you don’t leave out any page you may end up needing. How do you plan to grow? For shops, will you need many more categories or subcategories in the future? For informational sites, are you writing a book that will need an area on the site, or will you be adding a new portfolio area to the site? Put these future pages in your list. For shops, consider product categories carefully: how many products are in multiple categories? Can any categories be absorbed into another category? Categories should be a tool to locate particular types of items, and striking a balance between too few and too many should be your goal. For every possible website page you’ve written down, consider if it directly helps you with your goals, or if your customer would need or want the page. If not, cross it off the list. As you do this, you’ll need to think at least briefly about what goes on each of these pages and why. If you don’t have a compelling reason to include the content, don’t! Unnecessary content creates more work for you to update and manage, and more clutter for your visitor to wade through. One type of page really stood out for our team as unnecessary – press pages! We were all in agreement that a standalone page for press about your company is not the best way to show this info. Once you have a list of pages to include on your website, you need to decide how to prioritize them. Take each page you’re unsure about and run it through the flow chart in our guide to decide its fate. Once the links make sense for your visitors, look over them again based on your own goals as the site owner. Zoe, our developer, suggests that if your priorities don’t match your customer’s priorities (or at least overlap), that throws up red flags about your content and marketing strategy in general, and you may need to re-think the purpose of your site for you and your visitors. You have all your pages now, and you know roughly how important each one is. Now your task is to get pages organized into cohesive groups that your visitors will understand and be able to use to find what they are looking for. Group pages into lists of similar content. You can condense certain groups of pages into one page where possible (such as your shipping, returns, and other policies). When grouping info together into one page, prioritize it so that the thing your visitor is most likely looking for is up top, with further info to scroll through (rather than click to). Choose titles for each page so that it is obvious without clicking what information will be found there. If visitors have to click to tell what content is going to be on a page, go back to the drawing board on the name. Now you can take your pages and create a rough site map and/or wire frame to plan your navigation. A site map can be written out in the form of an outline or ordered list, and a wire frame is a sketch of the layout of a website (not the design), showing where each navigation area and piece of content should be placed. This may be something you want to do yourself, or something to leave to your web designer! If you’d like to dig into this some more, see how we organized the navigation links on the 1canoe2 website.